You can log email events to your Team Live Feed, Salesforce, and other services via Auto-bcc, so your team is aware of all your important communication activity. For example, when you send an email to a customer, you can log the email to your Team Live Feed so everyone on the team knows that you emailed Bernice about her renewal — and your team can also see Bernice's opens, clicks, and downloads. On the Small Business plan, you can auto-bcc your CRM or other service. And on the Growth and Enterprise plans, you can sync activity to Salesforce. If you're on the Growth or Enterprise plan, Connect to your Salesforce account, so emails get logged with the appropriate Contact, Lead, Account, or Opportunity in Salesforce — and your recipients' opens, clicks, downloads, replies, and meeting confirmations get logged in their Salesforce Activity History. If you're on the Small Business plan, add an email address to Auto-Bcc your CRM or other service, to automatically send a copy of an email wherever you need a record of it (you don't need to add an auto-bcc address if you've connected your Salesforce account). Create a team so you can sync to Mixmax - your team can see your emails in your Team Live Feed. Head to your Mixmax Teams page to create a new team. 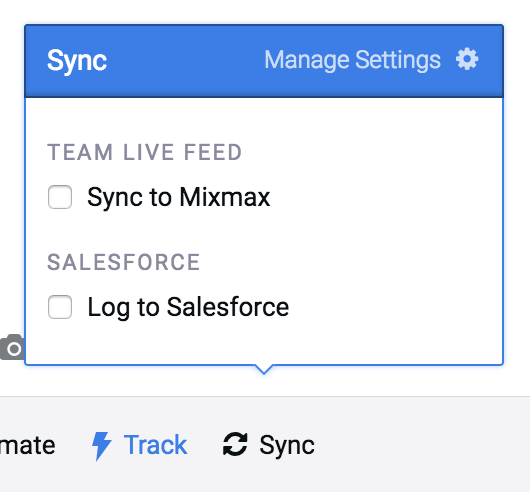 Once you've created a team, head to your CRM & Team Live Feed Settings page, where you can choose whether to automatically send events to the Team Live Feed and Insights sections of the Mixmax web app. You can also choose whether to your team members can view the content of the emails that you sync to Mixmax. Of course, you don't want every email synced to your Team Live Feed or your CRM. You can specify email domains and email addresses to exclude. It's a good idea to exclude your own company's email domain, and any task management or other services you use. You can also exclude individual email addresses — so if you email your partner or friends from your work account, your correspondence won't end up in your CRM! Now you’ll know exactly when a teammate has reached out to an important contact, and you'll see when and how contacts engage with your team's emails.